Smartwatches are definitely the new ‘thing’ every mobile phone company is coming out with. From Apple to Huawei, from Sony to Samsung, and the likes of Pebble and Casio, this is the new trend. It is a funny world, the world of smart watches, because you are paying a price between £100-£500, depending on the brand and functionality you go for, and with the knowledge that unlike traditional watches that will last you years and years and years (and hopefully decades), these will probably be as good as your smartphone when it comes to life. All that though, doesn’t stop companies and people from indulging, and there are quite a few interesting smart watches on the market. 210 mAh battery, lasts 2 – 5 days, my trial averaged at 4 days. While a bit on the chunky side, and that is not that different from anything packed with a health sensor, Alcatel OneTouch have definitely tried to give it the stylish fashionable look. 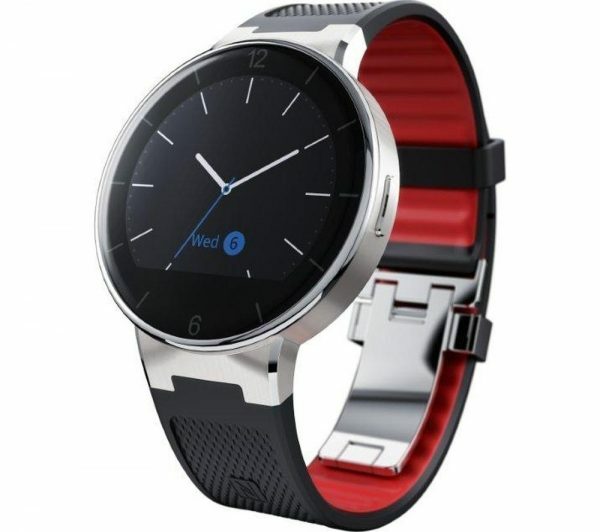 Doing so, they have thrown in a round screen, a metallic case and strap that features a clasp and a red trim, with that built in USB charging ability we talked about. The strap also has an NFC tag on it. 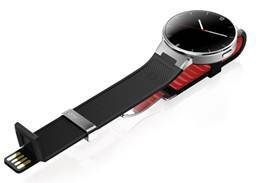 The display and design itself is not that different from the Moto 360. So much so that it even has that black ‘dead’ area at the bottom of the screen. While the UI does a pretty good job of trying to hide it, it still exists and is evident when you are looking at the usual watch face. A button on the side helps you control things, while the back features the heart rate sensor. The setup is fairly painless. Download the app on your respective OS (Android or iOS, as of now), setup an account, look for watch, pair it, and say yes on the watch. After that, you should be good to go. We immediately got an OS update on the watch as soon as we paired, though the OS update didn’t seem to throw in any major changes. One of the first things I noticed with the watch was pairing and Bluetooth issues. While it pairs really easily, once you have been away from your phone, it tends to struggle to catch up again. This meant that I tried everything, restarting my phone, restarting the watch, and in the end, unpairing and repairing the watch. It finally worked, but it was a pain. After that, I had several times where the watch and phone distance made it unpair again, but it paired back painlessly. While Alcatel OneTouch seem to put Android on all their phones, they have gone for a custom homebrew OS for their watch. This means that it plays nice with both Android and Apple devices. However, with so much work already gone into the likes of Android Wear, you will always end up playing catch up on your smart phone watches. The UI consists of an option of three watch faces to choose from, with a host of wallpapers to put behind them. A ‘click’ on the display brings you three screens of apps that allow you to see your activities for the day, stop watch function for fitness and general (i.e. there are two stop watch apps), music control, heart rate sensor, weather, e-compass, camera control, and various watch options such as brightness and vibration. The camera control works pretty well, and is as simple as it needs to be, i.e. open and click, while the music control is pretty standard. While all this is great, you don’t have any options to add any other apps, or change much. In terms of fitness, you can see the day’s activities in terms of steps, calories, distance travelled, time active and sleep. To see any notifications, you swipe up on the screen, and you can see anything that’s still a notification on your phone. While this one comes with a great battery life, it does so by keeping the screen off. That tends to be a major turn off for me, as I like to be able to glance at a watch to tell time, and not have to do anything like tap buttons or flick wrist, specially if I am in a rush and cycling, etc. On this one, you press the power button to turn the screen on again, or your move your wrist in front of your face and the watch detects this as a command to show you the screen. However, the wrist flick doesn’t always work, and there is definitely a knack to it. The longest you can keep the screen on is 15 seconds. Notifications are a major part of all smart watches these days, and in many ways they define what a smart watch tells you. The Alcatel OneTouch Watch has the ability to show you all notifications from your phone, including calendar ones. It does so by giving a vibrate, which I found to be a bit on the intense side (not as bad as the original Pebble), and depending on the notification, you either don’t get a screen or you do. For example, calls get a screen notification, while texts etc. don’t, and you have to turn the screen on to see what’s up. You can adjust what notifications you get from the app, and what apps send you notifications. The app does so in a funny way, the notifications are spread between the main settings for call and calendar, and notifications setting for rest of the apps. It does take notifications very seriously though. For example, it gives you a notification of every calendar activity, whether you want a reminder or not. As such, I was rudely awoken by the watch at midnight as I had set an All Day Activity on my calendar one week night. (Also, yes, I often go to bed early. I am sad like that). The fitness element is pretty good on this watch, it seems to measure your steps and activities fairly well. However, it only seems to store a day’s worth of activity, so you need to sync your device with your phone consistently. Normally this shouldn’t be a problem, and you can see extra details and older activities on the app. The heart rate sensor though, is not a constantly active feature. In fact, it relies on you to be stationary and still, which means you will have to pause whatever activity you are doing to take your pulse. This seems a silly one to me. This also means that you can’t log an activity that will constantly measure your heart rate. All in all though, when you are still and measure it, it comes pretty accurate. As mentioned already, I got 4 days consistently out of this. 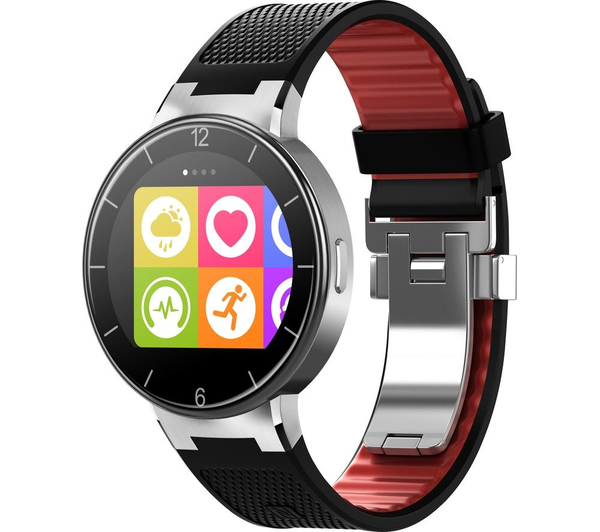 More information on the Watch can be found on the Alcatel OneTouch website. It retails for £99, and is available from the likes of Currys and PCWorld. It comes in black or white. It’s a funny one this for me. Packed full of features, a great price, but a struggling UI. It seems like a Windows phone in the world of Android and Apple.